Is a picture worth a thousands words? You be the judge. Yeah, I should have added that in the first comment. 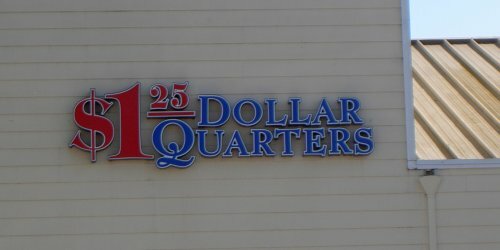 It is a “dollar” store. Seeing the rapid inflation of the dollar, I would calculate it as worth merely 775 words. Better buy now, before the dollar drops again! Maybe the dollar stores need a new approach to signage. This sign is very hard to update. Maybe they should just follow the lead of gas stations and have a variable “trademark.” You know, the “1 dollar, 1 quarter, 1 nickel” brand. Ops, sorry forgot the “9 mils.” No, that’s too expensive to change, as well. Instead, maybe they should just have a digital display and post the current exchange rate for a dollar store. If you’re worried about inflation own the land that the “buck-and-a-quarter” store sits on! Time to short all the stocks of dollar stores! Is that true? Wow … everything is really going up down there in the States ..
@Barb: That’s really good. They can follow what gas stations are doing. Funny thing is in Chinese populated areas in San Francisco, prices actually went lower! Its common to see 88 cents stores and one time in Chinatown I saw a 69 cent store. I had to go in and buy some stuff it was too cheap to pass up. I just really wonder how in the world can you make money that way. @ DT – Yeah despite the rise in gas, groceries, and almost everything else, I’ve found prices at Costco going down, too – a great plus. I heard some guy on the radio on friday saying that inflation was really running 20% a year.